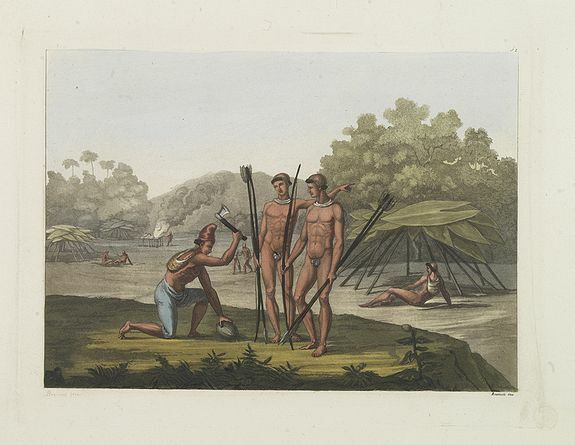 [ Patacho Tribesmen of the Rio do Prado. ] - FERRARIO, G.
Title : [ Patacho Tribesmen of the Rio do Prado. ]. Size : 6.7 x 9.3 inches. / 17.0 x 23.5 cm. Description :A native Patacho Tribesman is about to cut open a piece of fruit (melon?) with a hatchet while another holds a bow and arrows or spears while looking on. Behind them are a few more figures of the Patacho tribe and their typical dwellings. Engraved by Bramati after a print earlier published in Maximilian, Prinz von Wied (1782-1867) in "Travels in Brazil, in the years 1815, 1816, 1817."